George Frideric Handel is one of the most famous and most-frequently performed composers of the late baroque period. No wonder that his life and work are intensively studied. However, about his early years much is still unknown. That also goes for the work which is the subject of the present recording. Despite much research, scholars still can't decide whether the St John Passion is from Handel's pen. There are good arguments in favour of his authorship, but there are also reasonable doubts. In his liner-notes, Roland Wilson discusses them, and I am not going to summarize them here. If you have access to the Naxos Music Library, you can read what he has to say. The free poetic texts in the libretto were written at least in part by Christian Heinrich Postel, an experienced author of librettos for the opera at the Gänsemarkt in Hamburg. He died in 1705, and therefore, Wilson writes, the St John Passion must have been written and probably also performed before that. That seems a reasonable assumption, but there is no reason why a libretto from his pen could not have been set after his death. This oratorio is divided into two parts, and Wilson concludes from this that it must have been intended for liturgical performance. That in itself is not a decisive argument: many passion oratorios of the 18th century, which were definitely intended for public performance, are also divided into two parts. It is rather the fact that the gospel of St John is the core of this work which points in the direction of a liturgical performance. In that respect, it is comparable with the St John Passion by Johann Sebastian Bach. There is a major difference, though: this Passion is much shorter, as it starts with Jesus's being scourged. This could also be an indication that this Passion was intended for liturgical performance. The Musikdirektor in Hamburg, who was responsible for the composition of liturgical music for the five main churches, had the duty of writing write a Passion every year, but it could not be too long. In his Passions, Georg Philipp Telemann, who took this position in 1722, usually omits the episode of the Last Supper and the preparations for it. As a result of this late start in the narrative of the gospel. the part of Jesus is rather short. In the first part he only enters once, when Pilate asks him: "Knowest thou not that I have power to crucify thee, and have power to release thee?" It is notable that Jesus' answer is not in the form of a recitative, but an aria. In the second part, we hear only his words from the Cross. These are all set in the form of ariosos. The same is the case with the words of Pilate. It is also remarkable that this role is not, as in most Passions of the time, for a bass, but for an alto. Both Pilate and Jesus are accompanied by strings. The part of the Evangelist is, as was common practice, scored for tenor. He is accompanied by basso continuo, but his quotations from the Old Testament are accompanied by the strings. The role of the choir, which is in five parts (SATTB) is confined to the turbae. They have not a single chorale to sing, which is quite remarkable. The only chorale is in the first part: Durch dein Gefängnis, Gottes Sohn, which Bach also used in his St John Passion. It is here set as an aria for soprano. As Wilson assumes that this work was intended for a liturgical performance, he compensates for the lack of chorales by adding two chorale settings from the pen of Johann Crüger, which precede each of the two parts. Most of the arias are rather short, and usually take less than two minutes. The only exception is the bass aria in the second part, 'Erschüttre mit Krachen', which Wilson rightly calls "worthy of any opera": "Quake with thunder, flame throat wide asunder, O abyss, at this word!" It follows the exclamation of the crowd: "Away with him, away with him, crucify him!" It is also one of the very few da capo arias. A remarkable aria is the one for bass in the second part, following Jesus' exclamation "It is finished!". This word from the Cross, in the form of an arioso, is then included in the aria, again sung by the same singer, who takes care of the part of Jesus. This means that, although formally speaking this is a solo aria, it is in fact a kind of duet. There are also four genuine duets: one for two sopranos, one for two tenors and two for soprano and bass. Although the St John Passion is in some ways comparable with the Passions by Bach, the arias are often a bit different in character. In Bach's Passions they are always the expression of the feelings of the faithful. Here we find arias which address the audience, something that we also find in the Passion oratorios of the time. The first aria includes the lines: "Lament, O man, it is thee that is owing, that even God must suffer this scourging". The bass aria I mentioned above, ends with this phrase: "Forget not, o sinners order, that he, who hath you from Satan's death freed, on the cross ye will now murder". 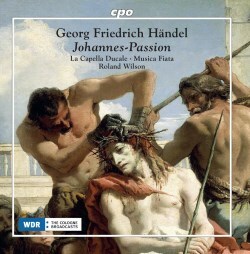 Wilson rightly writes: "Whether by Handel or not this Passion deserves to be performed more often". This is a very fine work, which has received little attention from performers and the recording industry. The only performance I have ever heard is the one directed by Pál Németh, reissued as part of Brilliant Classics' Handel Edition. That is a pretty good performance, but this new recording is in every way superior. Hans Jörg Mammel is a seasoned interpreter of Evangelist parts in German Passions, and he delivers a masterful interpretation of that part here once again. His diction and articulation are immaculate and he brings out every nuance in the text. The performances of the arias are excellent, without exception. The sopranos Ulrike Hofbauer and Ina Siedlaczek have very fine voices which are different enough to tell them apart. The same goes for Mammel and Tobias Hunger who are a perfect match in their duet for two tenors. Wolf Matthias Friedrich has a powerful voice, which is perfectly suited for the bass arias. Matthias Vieweg does everything right in the part of Jesus. The two altos (Alexander Schneider and David Erler) have relatively small parts to sing, but do so very convincingly. The tutti are performed by the soloists, which is in line with what we know about the number of singers the Musikdirector in Hamburg had at his disposal. One of the assets of this performance is also the use of a large organ for the basso continuo. As a kind of bonus, we get a cantata which is also attributed to Handel, and which probably dates from his time before Hamburg, when he was still a pupil of Friedrich Wilhelm Zachow in Halle. A manuscript with the cantata Ach, mich armen Sünder was once in the possession of Friedrich Chrysander (responsible for the first complete edition of Handel's oeuvre), with the name of Hendel. But this manuscript disappeared during World War II. Later another manuscript was found in which the cantata was surrounded by cantatas of Zachow, and scholars noted a strong similarity in style. On the other hand, in length it is very different from other cantatas by Zachow. It is a chorale cantata based on the hymn Ach Herr, mich armen Sünder by Cyriacus Schneegaß (1546-1597) on the melody of Herzlich tut mich verlangen. This work is clearly rooted in the 17th century; the five-part instrumental texture, with split violas, attest to that. Like Bach's Easter cantata Christ lag in Todesbanden (BWV 4), it has the character of a series of chorale variations per omnes versus. The opening phrase is an indication of the character of the hymn and the cantata, and links it to the St John Passion: "Ah, Lord, punish not me, poor sinner, in your rage!" The various stanzas are set in different ways. The first is a chorale prelude with the soprano singing the cantus firmus and the instruments ornamenting the melody. The second stanza is written in the form of a motet in the stile antico for four voices and basso continuo. The third is reminiscent of the lamentos of the 17th century, in particular because of the repeated notes in the strings. On the text "in death everything is quiet" the instruments fall silent, and the phrase of the tenor is followed by a general pause. The fourth stanza is for soprano and alto, and contains many Seufzer, which express the text saying "I am weary of sighing, have neither power nor might. (...) My bed is wet with tears, my body old from lament". The fifth stanza is quite dramatic: tenor and bass sing "Away, away, your evildoers". In the middle section the chorale melody is played by two oboes. The last stanza is for four voices, and includes ornamentation in the instrumental parts. This work also receives an outstanding performance by singers and instrumentalists. It brings to a close one of the best Passion discs I have heard in recent years.